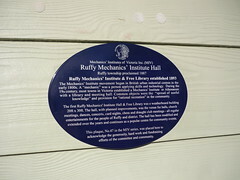 Ruffy Mechanics' Institute Hall. Ruffy township proclaimed 1878. Ruffy Mechanics' Institute and Free Library established 1893. The Mechanics' Institute movement began in British urban industrial centres in the early 1800s. A "mechanic" was a person applying skills and technology. During the 19th century, most towns in Victoria established a Mechanics' Institute or Athenaeum with a library and meeting hall. Common objects were the "spread of useful knowledge" and provision for "rational recreation" in the community. The first Ruffy Mechanics' Institute & Free Library was a weatherboard building 20ft x 30ft. The hall, with planned improvements, was the venue for balls, church meetings, dances, concerts, card nights, chess and draught club meetings - all regular entertainments for the people of Ruffy and district. The hall has been modified and extended over the years and continues as a popular centre for community events. This plaque, No. 47 in the MIV series, was placed here to acknowledge the generosity, hard work and fundraising efforts of the committee and community.